This is the shortest verse in the Bible. You can memorize it. Easy. Many people think of Jesus as a person who knew His mission, took charge, and made things happen. He walked on water, turned water into wine, healed people, cast out demons, and threw the money-changers out of the Temple in Jerusalem. A Man of action. A Man with a plan. Yet there was a softer side to Jesus. If you’re a man, I hope this verse lets you know that expressing your emotion through tears doesn’t make you less of a man. If the Son of God can do it, then you can, too. 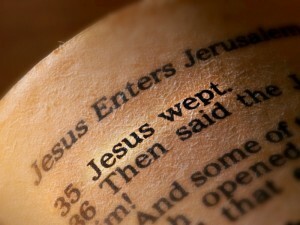 But Jesus didn’t cry over everything. Lazarus had died. A close friend and follower. Jesus knew the pain that death brought to the people He loved – Lazarus and his sisters, Mary and Martha. He even knew He would go to where Lazarus had died and raise him from the dead. Why did He cry? He cared. He had heart. So Jesus’ love was a caring love. He even cared enough to demonstrate that love while He lived on earth. He made some very strong statements against the religious leaders of the time. He let them know that their religion was in error, a ritual of performance-based perfection that didn’t even get them close to God’s desire for His love to fill mankind. Jesus’ actions show that our love of God should be a heart-based relationship that pours out of us into what we do. Is your heart, not only your mind, devoted to Jesus? Do your actions convey His love to others? Is your love like His tough love, helping people see the need to love and serve God and each other? « Have you tried to act like someone else?